A priest with Chicago area and Metro East ties has been named the new archbishop of Washington D.C.
Archbishop Wilton Gregory, currently archbishop of Atlanta, will succeed Cardinal Donald Wuerl, who served as Washington’s archbishop from June 2006 to October 2018. Gregory, 71, was born in Chicago, served as an associate pastor at Our Lady of Perpetual Help Parish in Glenview, a member of the faculty at St. Mary of the Lake Seminary in Mundelein and was ordained an auxiliary bishop of Chicago. He also served for 11 years as the bishop of the Diocese of Belleville. Gregory was born Dec. 7, 1947 in Chicago to Wilton Sr. and Ethel Duncan Gregory; he has two sisters, Elaine and Claudia. He attended St. Carthage Grammar School, where he converted to Catholicism. He attended Quigley Preparatory Seminary South, Niles College (now St. Joseph’s College Seminary) of Loyola University and St. Mary of the Lake Seminary. He was ordained a priest of the Archdiocese of Chicago on May 9, 1973 and three years after his ordination began graduate studies at the Pontifical Liturgical Institute (Sant’ Anselmo) in Rome. There he earned his doctorate in sacred liturgy in 1980. After having served as an associate pastor of Our Lady of Perpetual Help Parish, as a member of the faculty of St. Mary of the Lake Seminary and as a master of ceremonies to Cardinals John Cody and Joseph Bernardin, he was ordained an auxiliary bishop of Chicago on Dec. 13, 1983. 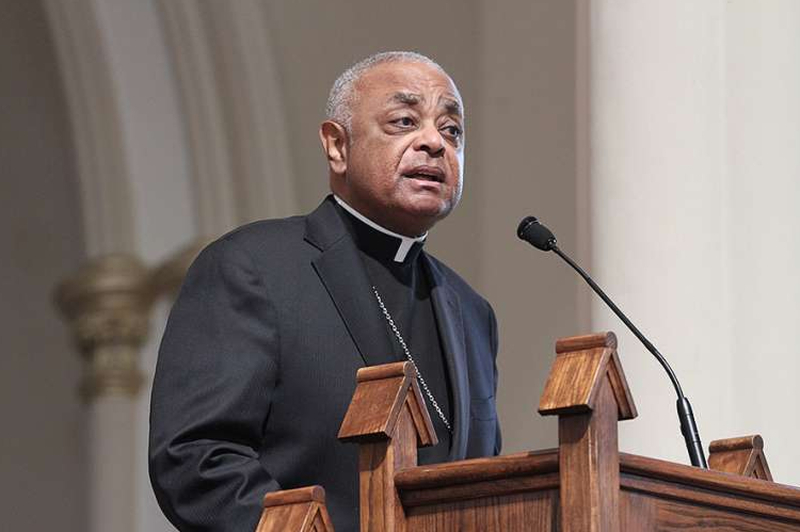 The Chicago Archdiocese issued a statement praising Gregory’s appointment. “With great pride, the Church in Chicago rejoices in the appointment of our native son, Archbishop Wilton Gregory, as the seventh archbishop of Washington,” the statement said. “Known to us, and especially his brother priests in this local Church, as a proven pastor and devoted friend, we offer Archbishop Gregory our heartfelt congratulations and warmest best wishes. We look forward to his continuing service to the people of God as he begins his new ministry in our nation’s capital. The installation of Gregory as the seventh archbishop of Washington will take place on May 21. On Feb. 10, 1994, he was installed as the seventh bishop of the Diocese of Belleville, where he served for the next 11 years. On Dec. 9, 2004, Pope St. John Paul II appointed Gregory as the sixth archbishop of the Archdiocese of Atlanta. He was installed on Jan. 17, 2005. He has served on the USCCB’S Executive and Administrative committees, the Administrative Board, the Committee on Doctrine and the U.S. Catholic Conference Committee on International Policy. He previously served as the chairman of the Bishops’ Committees on Personnel, Divine Worship and the Third Millennium/Jubilee Year 2000 from 1998-2001, and Liturgy from 1991-93. Gregory has written extensively on church issues, including pastoral statements on the death penalty, euthanasia/physician-assisted suicide and has published numerous articles on the subject of liturgy, particularly in the African-American community. Gregory has been awarded nine honorary doctoral degrees. He received the Great Preacher Award from St. Louis University in 2002; Doctorate of Humanities from Lewis University in Romeoville (2002-03); Sword of Loyola from Loyola University of Chicago (2004); Doctorate of Humane Letters from Spring Hill College in Mobile, Ala. (2005); Doctorate of Humane Letters from Xavier University in Cincinnati; Doctorate of Humane Letters from McKendree College in Lebanon, Ill.; Doctorate of Humanities from Fontbonne University in St. Louis; Honorary Law Degree from Notre Dame University (2012); and the Chicago Catholic Theological Union Honorary Doctorate (2013). In 2006, he joined an illustrious group of preachers with his induction into the Martin Luther King Board of Preachers at Morehouse College, Atlanta. At the National Pastoral Life Center in Washington D.C., Gregory was honored with the Cardinal Bernardin Award given by the Catholic Common Ground Initiative (2006). Tagged with: Archbishop Wilton Gregory chicago Chicago Archdiocese chronicle media Chronicleillinois.com Cook County Cook County Chronicle cookchronicle.com Illinois Metro East Metro East Chronicle U S. Conference of Catholic Bishops Washington D.C.